If the 350 thousand-odd Maldivians want to stay put, they may have to rebuild everything, starting with the ground they walk on. Located roughly 370 miles off the southwest tip of India, the island nation of Maldives sounds like paradise—over a thousand tiny oases of white sand beach, lush tropical vegetation, and warm, aquamarine water. But as the lowest country in the world, the Republic of Maldives is also being swallowed by the ocean. Global mean sea levels are currently rising at a rate of roughly 0.12 inches per year. By the end of the century, the IPCC predicts we’ll see up to a meter of sea level rise. And that estimate is probably conservative: The slow collapse of the West Antarctic ice sheet and the melting East Antarctic glaciers from below portend a far more dramatic redrawing of Earth’s coastlines. What this means is that the Republic of Maldives, and many other island nations around the world, are very, very screwed. Can anything be done? Architect and photographer Mayank Thammalla believes technology can help preserve the island nation’s sovereignty and its culture, if not its natural beauty. 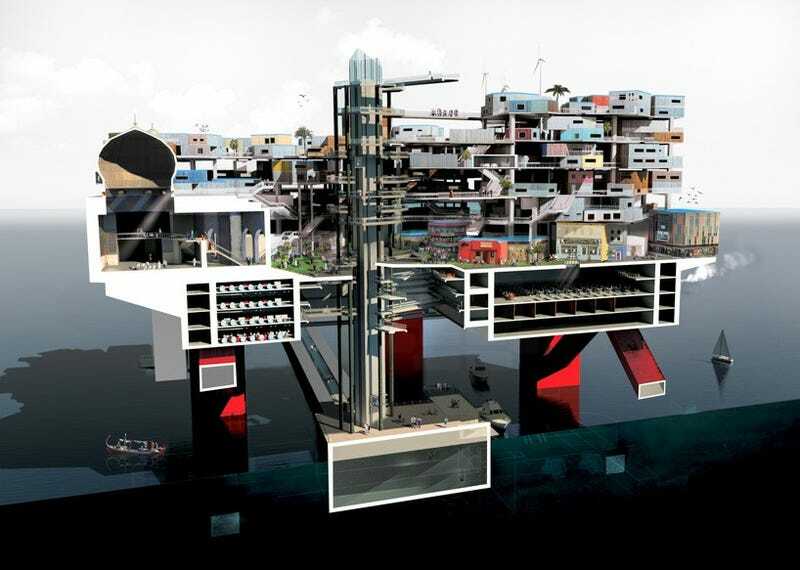 His “sink or swim” project reimagines the Maldives islands as a techno-landscape, composed of oil rigs transformed into standalone ocean cities. In today’s world we tend to design or invent completely new from scratch, but I strongly believe we already have the available technology and resources to respond to many global issues. Adaptive re-use of already existing technologies is something as designers that we need to promote for the sustainable move forward. What inspired me was trying to figure out a way to keep the Maldives in-situ and relocate the population on to semi-submersible oil rigs. At the same time to promote their existing cultural and traditional processes on to their new oil rig lifestyle. You’re probably thinking that oil rigs sound like a bit of a downgrade from paradise. That may be true, but Thammalla’s designs are nonetheless attractive, incorporating many elements of traditional Maldivian design. At the heart of each platform city, Thammalla envisions markets, shops and mosques, while homes with sweeping oceanic views encircle the perimeter. All images reproduced with permission from Mayank Thammalla. You can check out more of his work on his website and Facebook page.